If you want a flawless look for your wedding ceremonies, you are surely at the right place! UrbanClap offers the best bridal makeup in Bangalore that will make heads turn at you. To give you a perfect look for your big day, we train our bridal makeup artists in Bangalore to deliver the best service possible. Keeping in mind all sorts of budgets, bridal makeup in Bangalore is set at affordable prices. UrbanClap believes in perfection, and provides nothing less than that. So you don’t need to have second thoughts, just book for our makeup services in Bangalore in one click! The best bridal makeup artist. Makes client so comfortable. Very neat and professional work. Really a good makeup artist. She made me looking great on my day and she was also very conscious that i m comfortable. Her work was really awesome and appreciated by many of my family members. Nehad is perfect artist if you want to look your best on your THE DAY. She was so sweet and patient with me from the day I booked her. I would recommend her to everyone and anyone. I just loved her. I had an amazing make over by Nehad.... she just makes the bride look like a celebrity. Nehad treats her clients like they are her own baby she is completely ELITE when it comes to MakeUp's. IF IT'S BRIDAL MAKEUP IT'S NEHAD. Nithya is extremely talented and has an eye for bringing out glamour and beauty in each individual. Since I don't wear a lot of make up I completely relied on her to make the best decision and it was fabulous. It was completely worth every penny. Not very satisfied with the work.. It was my first experience with urban clap and it was amazing. Aarathi was pro in doing my makeup and hair style. She is soo patient and dedicated to her customers and took all my likes n dislikes into consideration. Thank you for giving me such a lovely look for the event. 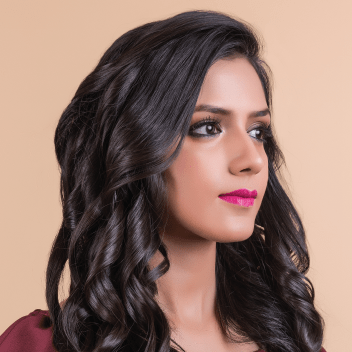 Evaluate their portfolios – As most professional makeup artists in bangalore put out works on their websites or on social media, you will definitely end up liking a few. But, it is vital to request their portfolios to see how varied their works can be and how they can make one look natural or bold. Good professional makeup artists can work with several types of colours and skins and distinctive styles. Hire only a makeup artist who has a diversified portfolio so that getting a customised look based on what you want would be easy. By checking different portfolios, you can also judge their respective styles of makeup looks. Check whether the makeup artist is booked on your wedding dates: If the makeup artist is booked on your wedding dates, confirm if she has sufficient travel time between other appointments and also for any unpredicted delays. It is not ideal to rush through your makeup for your big day. There are 2-3 bridal makeup artists in bangalore that I like. How should I finalise one? If you’ve found some artists whose works, you think, are better than the rest, speak to them on phone. Enquire if they have no bookings on your wedding function dates including the reception, sangeet, wedding, among others. Do ask about the brands of makeup products they use, and the types of makeup they are proficient in using. Airbrush, HD and traditional makeups are the three main types. Airbrushing is a technique of makeup while traditional and HD are separate types of makeup products. Traditional makeup is the most popular makeup seen on brides. A professional makeup artist uses first-rate traditional makeup products. This makeup goes easily with any occasion and skin type. Almost all methods, ranging from brushes and sponge to fingers, work. It usually isn’t waterproof makeup, and lies somewhere between sheerness and heavy coverage. With a professional makeup artist, you would always get a good result with traditional makeup. If your skin has uneven areas, the MUA (makeup artist) needs to apply more makeup on those parts that could be revealed on camera. It is required as nowadays most photos are taken through high definition cameras. The ingredients of an HD makeup give your face an unblemished polish when seen through an HD camera. It is liquid and it has more sheerness than traditional makeup. However, when applied it provides high coverage and gives you a natural look in photographs. A spray gun is used for this makeup technique. The makeup gives out a thin layer that is even and also provides a skin-like veneer. Out of all the types of makeup, this makeup doesn’t give out the cakey effect and also shows your actual skin tone. Although this makeup lasts up to 16 hours and is waterproof, you should never wipe your tears or sweat but just dab them. The best benefit of an airbrush technique is when the foundation is sprayed out from the spray gun, it oxidises with the air giving your face the actual foundation’s colour instantly. The genuine foundation’s colour with other makeup applications take about 15-20 minutes to show up. It is the perfect way to apply makeup, as the MUA is able to move at will from the uneven parts of a face. The airbrush technique is advantageous for anyone with irregular skin as the MUA can regulate the makeup application on those problematic areas. It is more see-through but through high definition cameras, the cakey effect won’t be there. The makeup always looks well mixed. 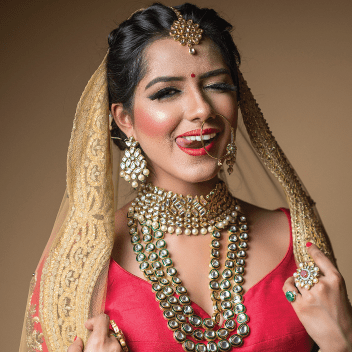 The costs of makeup for the reception, mehndi and sangeet, among others, would be lesser than the cost of makeup for the wedding day. Hiring the same MUA for all the wedding events would give one a discount on the whole price. If the MUA has to travel to another city for the bridal makeup, the accommodation and travelling expenses must be paid by the bride. What is included in a bridal makeup? Nails (basic nail paint; for nail art such as special gel nails you have to get it done independently beforehand). Preferably, just before the month of your wedding, you should take a trial session. This not only lets you gauge the real skills of an MUA but also lets you change your decision on the makeup look for your wedding, in case it did not turn out according to your expectations. Just do not hire any MUA who is not keen on booking a trial session or is not disclosing the list of rates and services for bridal makeup. Are trial sessions paid or free? You would be required to pay for most makeup trials. If you are booking the same MUA for the wedding as well, all the payments would be adjusted with the final payment. Full-face trial: You will get the whole makeup look but that wouldn’t be perfect as it would be done on you on your wedding occasions. This gives you a basic idea and it usually costs Rs. 1500. Half-face trial: The makeup is put on one-half of the face so that you can compare how you normally look. The makeup artist can put two different types of eye makeups on each eye or even apply airbrush makeup on one side and traditional on the other side of the face. You can openly communicate with the MUA on what makeup you would want and show her snapshots for reference. When your wedding dresses are decided, show the MUA those photos so that she would get a decent sense of getting you a balanced makeup look. Discuss the products that the MUA would use for your makeup and how they would complement your skin’s colour and type. Also, exchange views on eyelash and hair extensions and any of your concerns. When you are relaxed after speaking to the makeup artist, the session would start and you should notice what the artist does and listen carefully to whatever she tells. What are the criteria to judge my makeup at the trial? The makeup artist must put makeup based on the type of your skin. For example, oily skin needs a mattifying foundation. See if the makeup blends properly without showing any coarse lines. The blush, foundation, eye and contour makeup must flawlessly merge. Your cheeks must not have blush in large amounts, as it could give you an unnatural look. You should check how you look with the makeup by clicking pictures of yourself in artificial and natural lights. You should specifically see if the foundation is of the same colour as your skin, if acne marks and any blemishes on your face have been put out of sight, and whether there is a suitable reduction of dark circles on your face. Too much dark circle reduction could make you look odd. The MUA should know for how long the makeup lasts. Ask important queries: Catch up on the makeup artists in Bangalore and ask the type of products they generally use. If you are allergic to particular ingredients or your skin is delicate, you must ask about it first. Also, to have a basic awareness of the amount you would pay, ask them what would be the cost of bridal makeup in Bangalore. Don’t let low prices be the main deciding reason to hire a bridal makeup artist. You should ask and how do they retain their quality and what products they use. You can try and balance out on the quality and cost. Interrogate their practice of hygiene – Professional makeup artists usually keep their kits clean and organised and their products are well maintained. They only use washed up sponges, clean brushes, disposable mascara wands as well as proper mixing palette for products. They also frequently sanitise their makeup and know exactly where to place each product in the kit. When an MUA in Bangalore is providing low-cost bridal makeup services but his/her makeup kit is disordered and unclean, just don’t hire him/her for your wedding day. Share your frame of reference and see how they react – Be it a simple or a bold makeup look that you want, ensure that the MUA is listening carefully to what you prefer. Let the MUA give you ideas after you have shared some pics of makeup looks that motivated you. If the makeup artist is not caring about your choices and pushing his/her views, don’t hire the MUA. Make a query on the terms of payment on how much advance and when it is required, the payment mode, and policy of cancellation, among others. The total number of people the MUA would bring to the wedding in order to confirm the space needed. Booking the same MUA for all the functions would be useful. You would not only be able to communicate better if you want to make changes later but also get a discount in bulk. 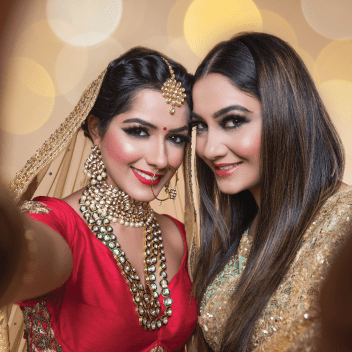 For instance, if during the sangeet function your eye makeup was excessive you can request your MUA to make it less apparent on succeeding functions. You should hire another party MUA who can apply makeup to your relatives and friends as the bridal MUA can only cater to you only during the wedding. Your MUA can bring an additional team to apply makeup on others. The MUA can tell you if any treatments would be required prior to the wedding, as she recognises your hair and skin type. She can tell you to do a hydrating facial considering you have dry skin, or you just might need blackhead removal and exfoliated skin with a simple clean up. Facial should be done 48-hours prior to the first wedding function. Makeup is not advised instantly after a facial. Waxing and threading have to be done 24-hours before the first wedding function, after the skin’s redness settles down.